The Ojibwa (Chippewa) believe that night is full of both good and bad dreams. When a dream catcher is hung above the place where you sleep it moves freely in the night air and catches the dreams as they drift by. The good dreams, knowing their way, pass through the opening in the center of the webbing while the bad dreams, not knowing the way, are caught in the webbing and destroyed at the first light of the morning sun. 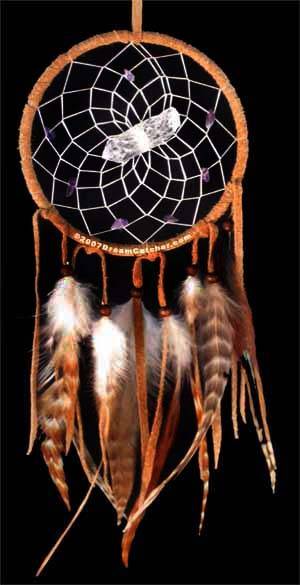 There are many variants to the dream catcher legend, some which say both the good and bad dreams are captured and some which say the good dreams slide down the feather to those sleeping below. Although the Ojibwa are credited as the first people to use Dream Catchers many other Tribes and Native peoples have adopted Dream Catchers into their culture. Even though the designs and legends of Dream Catchers differ slightly, the underlying meaning and symbolism is universal and is carried across cultures and language barriers.